SL's latest car quest: Sorted! So, as my signature suggests the beloved 240K has gone and left a big hole on my driveway. I decided at this point the Galant didn't really do quite what I wanted when I'd already got the Accord, so that got put up for sale and fairly quickly found a buyer. As soon as the 240K drove up the road and I heard it's lovely six-pot I knew that's what I still had to have in my life (with RWD). As Cedrics are now serious money and I've 'done' 240K for now, a Laurel is the most obvious choice (unless a Crown pops up of course). It's a Japanese-spec C32 hardtop (!) with RB20E engine and auto 'box. And a lovely wine red interior. As I've mentioned before, I actually saw it in Harwich some years ago and spoke to its then owner, and later even had a drive in it. It's moved on since, and is available at a reasonable price though sadly without MoT. Insurance might be an issue as it's an import, though it's old enough to qualify for the classic policy I use on the Accord etc. To be investigated. Odd thing is over the last few days while I've been on a camping holiday I've been convinced that I would buy the T-plate C230 200L with 33k that was for sale very near me for Ã‚Â£1200, was in CCW. Sadly that was sold last night, and the Prelude at Ã‚Â£695 in there has also gone. This is also been watched with interest, I have a grille which would be of use on it! Awaiting better pictures, but seems a bit of a gamble for what I want. That's a Laurel C33 hardtop, with RB20ET engine. I think they're a fantastic shape, just a shame this one doesn't at least have a current MoT. probably a bit too new to go on a classic policy too. 1-owner Subaru auto, 41k on the clock! Tidy-looking Sunny, only a 1.2 though. Flippin' lovely Celica 1600ST, great pic's too. Will probably go for more than the grand maximum I can spend. Will (Datman) is also selling his dad's 300C estate, nice one with low miles. 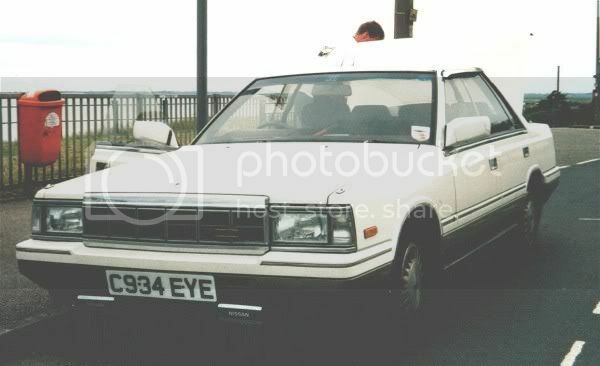 Would be very interested if I hadn't already had one (and two saloons) plus I already have the Camry as a big wagon. Phew. You kept up with all of that? Loads more have been filtered out, and 'd be interested to hear of others similar up to a Ã‚Â£1000 (preferably less!) that fit my criteria. I don't see every advertising media going, could be there's something languishing unsold in your local paper etc that's just what I'm after! The JDM C32 Laurel is my top contender right now. I would suggest something either luxurious or sporty as the ordinary-ness of the beige Galant seemed to be its main problem!I vote the C33 Laurel provided you MOT it and tidy it up a bit, they are just lovely and it's a MEDALIST! What more do you want man! 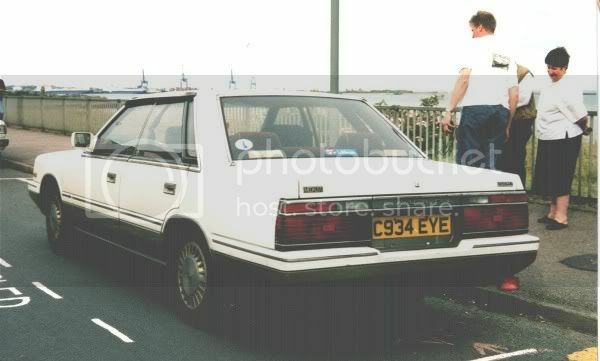 Ooh, Subaru L-series saloon - that must be a near-extinct breed now. Probably pretty dull to drive with the slushbox though. This is also been watched with interest, I have a grille which would be of use on it! What better reason could there be? Personally I'd go for the Celica XT, but that's a very personal thing because I love the styling on those (the BIN has gone now though). That 2 Door Sunny's for me! Either Celica, or find a Manta/Cav with MOT. None of the others do much for me, I'm afraid, although I could see the potential in a Subaru L-series manual. I don't know why Mk1 Preludes go for so much money, the Mk2 (83-87 model) is far nicer if you ask me. ARGH! What a list of options!! !The Subaru saloon looks magnificently ordinary, and yet very alluring for the obscureness factor. Almost Hirstistic.Me, I'd be going hell for leather for the brown Celica. Or the Mazda 323 wagon.Or the Silver Datto. In that order. Personally, I love the EYE the most. And the Prelude just a bit less. That Subaru is quite the machine isn't it? Amazing that it retains its original hubcaps. I see a 1.8 GL one in town fairly regularly with no hubcaps (think the GL didn't get them), about 5 badges on the grille and an old man driver. Would come up really well with some wax and polish. Hugely tempted to leave a note! I would be torn between these two. Those Preludes have allways looked good and being a Honda would be reliable. The nissan looks rare now and is pure 70's + you wouldnt park next to one at Tesco's. - Bit dull! Nice hat buddy. - The doorman has my white gloves! Cool! - They imported one to the UK for this advert?! Can't make out the plate! - New Laurel. Perfect for driving out into the middle of forests. http://www.youtube.com/watch?v=H-MImd_rfsI - Don't jump! Here's a Laurel! http://www.youtube.com/watch?v=UPcTuwwl0p4 - Non stick-on sunroof action! http://www.youtube.com/watch?v=GpHDN23f5m8 - Huge advert that says "cruising" a lot and also "SPECIAL PRIVATE CAR". http://www.youtube.com/watch?v=YLPTjeJ3gS8 - Come on Subaru, your adverts are letting the side down. http://www.youtube.com/watch?v=WcRQL1Ce8b0 - These don't have men in waistcoats or anything! Can't find any for the other ones, though. Only different generations! Pros: Japanese mafia staff car + lowering and rims will make it look ace. Cons: Whats lurking under that vinyl roof? Might be pricy. Cons: you have a big wagon already. Banger racers may take too much interest. Pro: great looking car, parts easy to obtain. Cons: prices could go mental, styling not special enough. Cons: relatively common? not enough power. Pro: unusual but satisfying machine to own. How cool would this look modded? Pros: buck the trend, buy it and love it. Cons: likely to go to silly money. Cramped. Pros: well built, engineering. Potential to do something different. Cons: lack of power, you'd be too scared to rack up serious mileage. Pros: practical and neat styling. mileage. I'd be tempted by the Subaru or C32 hardtop. Here's something very close to you and a bit of a wild card. This might be a bit small but another low mileage beauty. 1. A plain, warp-knitted cloth of any of various yarns. 2. A soft ribbed cloth of wool or a wool blend, usually used for dresses. I don't think the Subaru would be a parts horror, they're pretty popular in Australasia and North America. Thats wuvvums woptank!! I'd love to get my welder on it. Not gonna happen though sadly. Yeah the Subaru would be OK I think, I bet all the mechanical bits you could get parts from Blueprint and any obscure bits of trim you'd be able to get from overseas if required. It's just a shame about the autobox!It's got to be the C32/C33 I think. The rest of the stuff is either too "ordinary" (meaning they won't get much use over the Accord), too expensive (the Prelude and brown Celica), or you've owned it before! The Subaru is still very tempting though I reckon, especially in that condition. Woops, I clicked too many adverts and now I have JapCacophony on my pc... excellent work though! Full range E-AT ftw! What about this oddity Slorrel? Appears to have the steering wheel on the wrong side like. Whoah! On the right side for me... what a lovely squary thing. Lobbed off for non-payment of fees? I owe them Ã‚Â£80 at the moment. Robbin' bastids. I got a 'non-paying bidder' strike off em for an item I had paid for with paypal! And, after cancelling my VP agg auction they refunded me the listing fee but kept the FVF fee! Bunch of shites. 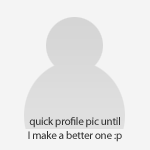 That Cerica looks a lot better in your pics! Thats awesome, the interior even looks like an Almera or something. Been busy listing nappy covers tonight (don't ask), good to see some interesting - if not entirely sensible - suggestions.If that President is selling here at Ã‚Â£1995 they must be worth pennies back in Japan!Accord is an oddity, USA import I suppose? Wonder if it's one that was built there, seems curious to have that and Aerodeck, and wasn't there a 2dr notchback too? Barmy. I agree with RW, price a bit high especially given it doesn't state anything about T&T.Prelude topped out at Ã‚Â£720 reserve not met, think it went higher last time.Celica ST already way over my budget!Torsten, interesting you saw the XT. Can you recall what price was in the window? Needs better wheels on it. I don't think that 2-litre 4-pot would be a particularly inspiring engine - gruff and willing maybe, but I imagine neither revvy nor hugely powerful. That President is a stretched Q45 - one of the best Q-cars ever made, and certainly in the Lancia Thema Ferrari league. The Q45 is a rare sight over here, but I see them every now and again. Faster than they have any right to be - comfy too.They live on today in the CIMA and FUGA models - I'll post some pics later. Say what you like, but sticking a 4.5 V8 in a bland saloon floats my boat and has it going at full sail. OK, not so bland now (you have to see these in the metal to really get how good looking this car is), but this Nissan Fuga is the "Japanese Jag" out here.